Six more editions have been added to the Guyana Classics Series. This series is perhaps the most important development in Guyana’s literary history, far more important and beneficial than the hosting of CARIFESTA which was successfully done a few years ago; and far more important than the Guyana Prize for Literature which has failed to stimulate local literary output. The Guyana prize for Literature has become a fishing expedition for writers in the Diaspora who have gobbled up most of the awards. But the Guyana Prize for Literature is now going to be overshadowed by the publication of the Guyana Classic Series. The recent additions to this series now mean that there are some twenty six works about Guyana that form part of this significant addition. The Guyana Classics is by far the most important literary event in our country’s history since Independence. It allows important works which would otherwise have been left to gather dust on the shelves of libraries and in private collections to become part of the local repository of literary history. This collection is part of our literary heritage. In the future, other important works will be added. Guyana has produced outstanding literary personalities amongst which Edgar Mittleholtzer must be ranked as our greatest novelist. He was by far the most prolific local novelist at a time when there were not many local writers. His prose was simple and dealt with many local themes unlike many of our present day crop of writers who bypass the local setting in their publications. The Guyana Classics has also given recognition to Martin Carter who is referred to as our national poet. A country should never have a national poet. There should be many national poets whose works should all be given the recognition that they deserve. In the case of Martin Carter, he owes the title of national poet more to his middle class roots and the fact that his output though sparse and erratic, reflected a perspective of one who was involved in the events that gave rise to his poetry. This is what makes his poetry special. It reflected his personal bitterness and frustrations, his middle class outlook, his friendship with key political figures and their politics. His work is showing promise to be dwarfed by other local poets in the future but it is hardly likely that any local novelist could match the feats of Mittleholtzer. Mittleholtzer deserves a special place in our literary collection. In fact he deserves posthumous recognition as our greatest writer despite the dark forces that possessed him and which led to his suicide. He deserves to be honored by the government of Guyana. A fitting monument and reading park should be erected in his memory and all his major works should be included in the Guyana Classic collection. Guyana should be proud of this collection. We should be proud to show it off. It should be available to both locals and foreigners to purchase. This of course is easier said than done. The poor man may not be inclined to purchase this collection. It is affordable but not cheap. But the poor man can have access to those copies that are available in the libraries. There is however a better way in which this collection can become more widely disseminated. It is through radio. Many, many years ago there was a drama adaptation produced for radio of Edgar Mittleholtzer’s My Bones and My Flute. This is the sort of work that lends to such dramatic productions and there is no reason why this particular adaptation cannot be dug out of the archives and replayed for radio lovers in Guyana. There is no reason why other works, including non- fiction and poetry, cannot be serialized for radio. This would allow tens of thousands of Guyanese to learn more about these works. It would be a useful way of ensuring that the Guyana Classic collection reaches the small man. Today when you turn on the radio, there are very few programmes of any educational content. It is mostly music and more music. So how about special readings dedicated to these classic works so that more Guyanese can partake of this rich heritage that Guyana has and which are now being published as part of the Guyana Classic Collections. The serializing of selected works of this collection will also help to boost sales of the classics because those who hear the serials will eventually want to read them in full. The Ministry of Culture yesterday handed over copies of the Guyana Classics books to secondary schools. The books were released under the new Caribbean Press publishing house, established by the government. Some of the Guyana Classics Library books that were distributed. Eleven books on various aspects of Guyanese people, culture and literature are the first set of a 36 Guyana Classics collection. Professor David Dabydeen is the honorary editor of the Caribbean Press, which was established in 2009 by the government of Guyana to reprint out of print and rare books on Guyana and to publish contemporary writings by Guyanese and Caribbean writers. According to Dabydeen, the books were launched six weeks ago and the 11 books set were already handed over to the National Library and the University Library. Yesterday’s handing over was a presentation to the secondary schools. Making remarks on behalf of the Education Ministry, Assistant Chief Education Officer Melcita Bovell stated that the schools were fortunate to be receiving the books, which she says will help to shape the citizenry of the country. “We are not really a people if we do not know our past,” she added. Meanwhile, Culture Minister Frank Anthony stated that he was pleased to be a part of the process of the creation of space to publish past and encourage new writers. “A place where they can publish and use their creative energy” he added. According to the minister, in the next three to four months, 12 additional books will be out, while in about two months the first 11 books will be on sale for the public. Bookstores identified to sell the books include Austin’s Bookstore and the Michael Forde Bookshop. The monies from the sale of the books, the minister said, will go to a fund which will be used for further works that the Press will undertake. 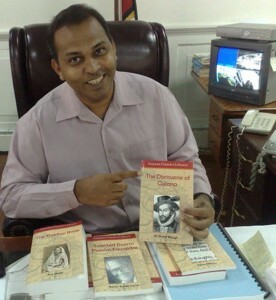 Anthony noted that the Caribbean Press is housed at the Ministry but, according to Dabydeen, the books are printed in England because it is cost effective. The Minister said that queries about the Caribbean Press can be made at the Ministry and he admitted that more can be done to explain how selection of works are done and the process potential writers have to go through. He added too that the Press was called the Caribbean Press because there are plans to expand the publishing house to other Caribbean countries and writers. Anthony added too that consultations were made with scholars and historians both in the Caribbean and internationally when reviewing the works selected to be part of the Guyana Classics. Meanwhile, at the handing over presentation, a poetry and short story competition was launched. The competition is targeted for school children up to the age of 18 years. The poetry competition is intended for primary school students under the age of 12 years and poems should not be more than 30 lines. The short story competition is for students between the ages of 13-18 years old and short stories should not be more than 1,000 words. The closing date of submission of entries should is July 15 and must be submitted to Petamber Persaud c/o Ministry of Culture, Youth and Sport. The stories and poems will be published in an anthology by the Caribbean Press. Persons wanting more information can contact Petamber Persaud on 226-0065 or email him at oraltraditions2002@yahoo.com. On Thursday April 8, 2010, when the Guyana Heritage Society launched ‘The Twelve Views in the Interior of Guiana’ by Robert Schomburgk, it was executing one of its objectives, which is to preserve the literary heritage of this country. This book first surfaced in 1841. The launch of Schomburgk’s book comes within two years of the society’s reprinting of Webber’s ‘A Centenary History and Handbook of British Guiana, 1831-1931’, first published in 1931. In 1997, the society reprinted Rodway’s ‘Story of Georgetown’, first published in 1920. The Guyana Heritage Society also reprinted Arno’s ‘A History of Victoria Village’. The reprinting of ‘The Twelve Views in the Interior of Guyana’ by Robert Schomburgk is an important gesture, an indicator as to the premium placed on literature and the preservation of the literary heritage of a country. This gesture is one in an impressive list of reprinting of rare and out-of-print books on Guyana by local organisations and foreign bodies. Not too long ago, February 2010, the Government of Guyana through the establishment of The Caribbean Press released the first eleven reprints of a projected thirty-six titles labelled The Guyana Classics Library. The idea of The Caribbean Press surfaced during Guyana’s hosting of the highly successful Carifesta X in 2008. The idea was later fleshed out by President Bharrat Jagdeo and Professor David Dabydeen. A few of the recently released titles in The Guyana Classics Library include ‘The Discovery of Guiana’ by Sir Walter Ralegh first published in 1595, ‘The Coolie, His Right and Wrongs’ by John Edward Jenkins, ‘Canoe and Camp Life in British Guiana by Charles Barrington Brown, ‘The Chinese in British Guiana’ by Sir Cecil Clementi, ‘The Asylum Journal’ by Robert Grieve and ‘Guianese Poetry: covering the hundred years’ period, 1831-1931’ by N. E. Cameron. Another local organisation to come in for praise is the Indian Commemoration Trust that republished Ruhoman’s ‘Centenary History of East Indians in British Guiana 1838-1938’, first surfaced in 1947. The Trust’s reprint came out in 1988 to mark the 150th anniversary of the arrival of Indians from India to Guyana. In 1998, the Indian Commemoration Trust published ‘They Came in Ships: An Anthology of Indo-Guyanese Prose and Poetry’ compiled by Laxhmie Kallicharan, Joel Benjamin, Lloyd Searwar and Ian McDonald. Macmillan Caribbean based in the UK republished in 2003, ‘Lutchmee and Dillo’ by Edward Jenkins, first published in 1877. ‘Lutchmee and Dillo’ is the fictionalised version of Jenkins’ ‘The Coolie, His Rights and Wrongs’. Hansib Publication, UK. In 2008, Macmillan Caribbean republished ‘Themes in African-Guyanese History’ by McGowan Granger & Rose. An ongoing new venture for Peepal Tree Press, UK, is the reprinting of Caribbean classics including Jan Carew’s ‘The Wild Coast’, Wilson Harris’ ‘Heartland’, Edgar Mittelholzer’s ‘Corentyne Thunder’, Denis Williams’ ‘Other Leopards’ and ‘The Third Temptation’. The Derek Walcott Press, UK, republished Egbert Martin’s poetry in ‘Selected Poems of Egbert Martin’, poems taken from ‘Leo’s Poetical Works’ (1883) and ‘Leo’s Local Lyrics’ (1886). Reprinting is not new to Guyana. Such an idea goes back to the ‘Guiana Editions’ of the early twentieth century with the efforts of Vincent Roth and other custodians of the literature of Guyana. The Guiana Editions was made of some seventeen titles published within fifteen years, a venture intended to bring back into circulation ‘forgotten and unavailable books on Guyana’s past’. Some titles include ‘Experiences of a Demerara Magistrate’ by G. W. Des Voex , ‘Letters from Guiana’ by G. Pinckard, ‘A Soldier’s Sojourn’ by T. S. Saint Clair, and ‘Twenty-five Years in British Guiana’ by H. Kirke. Of course, this is not a comprehensive history of reprinting of our literary heritage; suggestions, additions, modification welcomed. “This is just the beginning,” President Bharrat Jagdeo said as he launched the first 11 Guyana Classics, in a series of 36 which focuses on literary works of renowned Caribbean artistes, at the Umana Yana, last evening. The 11 titles include ‘The Discoverie of Guyana’ by Sir Walter Raleigh; ‘The Chinese in British Guiana’ by Sir Cecil Clementi; ‘The Shadow Bride’ by Roy Heath; ‘The Asylum Journal’ –Volumes One and Two, by Robert Grieve; ‘The Coolie –His rights and wrongs’, by John Edward Jenkins; ‘Canoe and Camp Life in British Guiana’ by Charles Barrington Browning; ‘Guianese Poetry –Covering the Hundred Years’ Period 1831 – 1931’, by Norman Eustace Cameron; ‘Selected Poems’ by Egbert Martin; ‘The First Essay’ by Theophilius Richmond; and ‘Selected Poems – Poesias Escogidos’, by Martin Wylde Carter. Amidst a gathering of culture connoisseurs, the President made it clear that no amount of money could have delivered the publications, and he lauded the efforts of the project’s visionaries, Dr. Ian McDonald and Professor David Dabydeen. “We will support this project to the end,” Jagdeo posited. On the same note he reflected on the efforts of the late Mrs. Janet Jagan to revive the arts. According to the President the former president’s efforts were “tireless” in advancing a revival of expressive arts in Guyana. “She recognised in the initial years that things were very difficult and often was very creative in trying to get many initiatives supporting the art,” he said. Jagdeo observed that this commitment is entrenched in the hearts of many people and affirmed that the revival of the arts is an “absolutely necessary task” to complete the revival of the society. Alluding to the efforts of the PPP/C administration, the President said in the initial years, the emphasis was on the “basic” things, water and health care –for example, but made it clear that this in no way negated recognition of the need for the arts. “As the country progressed – today we are doing that significantly, the focus shifted a bit,” Jagdeo said. He reminded the gathering at the Unman Yana that in the current administration’s 2006 manifesto, $100M was committed to the same, in addition to the budgeted amount for the operations of the Ministry of Culture Youth and Sport. That done, Jagdeo said there is now available a pool of resources to support the Guyana Classics initiative as well as several other initiatives aimed at developing the arts. According to the President, for a culturally young country, Guyana has sufficient achievements to start forging a unique Caribbean/Guyanese identity. “The source of inspiration for that identity lies not in economic well-being; you can have economic well-being everywhere…It is recognized that literary arts is important,” he said. In addition to the literary arts, Jagdeo committed to working with groups to advance the culture. Once more the President reiterated his support, by “giving grants,” for other proposals that seek to pilot advancements in this direction. Linking these proposals to revive the arts, Jagdeo said, will also situate it in the “big future” of arts in Guyana. Minister of Culture Youth and Sport, Dr. Frank Anthony said reprinting written language is an effort that will be pursued in the long run. “We are bringing the written language to the youth,” he said. He added that with the establishment of the Caribbean Publishing House, in May 2009, Guyana will be able to make to Guyana’s words heard. He added that the press is one that is available to the entire Caribbean. “We have a rich literary tradition and if we want to continue this and affect the persons of the next generation,” Anthony said. He added that a subscribers’ list will be complied based on demand. Dr. Ian McDonald stressed that the contribution made by this effort is nothing less than valuable. According to him, it shows that the current administration values not only material things but also initiatives that nourish the mind and keep alive the cultural tapestry of the nation. He said one of the “firsts” is the book that looked at the first study on Chinese life in the early days of Guyana, as well as the study on Indian life with ‘The Coolie – his rights and wrongs’. Dabydeen pointed out that in the space of five months a “major task” was pulled off with each of the 11 publications carrying scholarly essays. According to the professor the upcoming publications include focus on Berbice slavery and Amerindian life, among many others. He also said public libraries and secondary schools in Guyana will also be in the possession of the 11 publications. In keeping with this idea, President Jagdeo handed over a collection of the Guyana Classics to the University of Guyana and the National Library. The Government of Guyana through the Ministry of Culture, Youth and Sport in collaboration with renowned writers Professor David Dabydeen and Dr. Ian Mc Donald today launched several reprinted classic Guyanese novels at the Umana Yana. President Bharrat Jagdeo, Minister of Culture, Youth and Sport, Dr. Frank Anthony, Professor David Dabydeen and Dr. Ian Mc Donald share a light moment at the launching of the Guyana Classics at the Umana Yana. Addressing the distinguished gathering, President Bharrat Jagdeo recognised that this innovative move would not have been possible without the hard work of many creative people particularly Professor Dabydeen and Dr. Mc Donald. “No amount of money could have delivered this product had it not been for the creative commitment of so many people and we are extremely grateful as a Government for this service,” he said. He assured his continued support towards the completion of the project as it entails much more than what was accomplished today. Recollecting the late Janet Jagan, the President disclosed that she was deeply concerned about the decline of the arts in Guyana and was a tireless advocate for its revival. He noted that she often sought financial resources to aid in this regard. President Bharrat Jagdeo poses with the Guyana Classics at the launching ceremony. “She recognised in the initial years that things were very difficult and was very grieved in trying to get many initiatives supporting the arts without recourse to the treasury,” he said. The Head of State affirmed that that commitment within the Government and the leadership of the party (People’s Progressive Party) as a whole was entrenched in the hearts of many people. “We recognised that the revival of the arts in Guyana was an absolutely necessary task to complete the revival of the entire society,” he said. The President said that in the initial years of development, much focus was placed on creating better living conditions for Guyanese. However, as the economy became more self- sufficient and the country started to progress, the focus shifted to incorporate the revival of the arts and other aspects that were not given much attention. Testimony of this aspect is evident in the PPP’s 2006 manifesto in which a declaration was made to set aside $100M per annum in every budget to support the arts and sports outside of the regular allocation to the Culture Ministry. “We are relatively young culturally but we have sufficient achievements to start forging this unique, Caribbean Guyanese identity and the source of inspiration of that is not economic well-being but in our arts,” the President said. Minister of Culture, Youth and Sport, Dr. Frank Anthony in his remarks said that last year the first 12 books in the series were published and after seeing the quality of the books, resources were provided to publish another 12. Within the next few months, a similar number will be published to conclude the series. He highlighted that in an effort to preserve Guyana’s rich history and culture, they will be working with schools to ensure that children harness the skills of creative writing. He added that this venture is not only about preserving the past, it is also helping to nourish the young generation into emerging writers so that they can continue the trend of expressing themselves through creative writing. Professor Dabydeen said that within five months, through a voluntary collaborative effort with Dr. Mc Donald, they were able to produce 11 editions, with each title carrying a specially commissioned scholarly essay. Dr. Mc Donald lauded this development, which he considers extremely important in keeping alive the social fabric of the nation. A special presentation of the Guyana Classics was made to the University of Guyana’s library and the National Library. A nation that celebrates its literature is a nation on its way to realising its full potential. Guyana is not lacking in this respect. Down the ages, the custodians of Guyanese literature were mindful of its development. There are many literary prizes attesting to such. Going back to the 1950s and 1960s, there was the Cheddi Jagan Gold Medal for Literature. According to Dr. Jagan, ‘the Guyanese writer has a major role to play in the rebuilding of our society…people engaged in the arts must see themselves as part of the development process’. But the prize is more than that as seen through the words of Mr. Hoyte when he made the original announcement of the prize on February 23, 1987, saying, ‘the encouragement of good writing has valuable spin-offs in society…it encourages clear thinking and clear expression…if success in solving problems is to be achieved’. Apart from those two mentioned prizes (there were many others), there were other enabling factors like the flowering of literary magazines and journals, all of which have made significant contributions, but are now defunct save and except The Guyana Annual (started as the Chronicle Christmas Annual in 1915). Other factors enabling the establishment of a Guyanese literary heritage include the flowering of literary groups, discussion circles, the establishment of an arts council and publishing houses with a basis for Guyanese works. Guyanese literature still in its formative years is in a relatively healthy state. This will be further enhanced with the establishment of an indigenous publishing house – The Caribbean Press, of which David Dabydeen is the general editor, Ian McDonald the consulting editor and Letizia Gramaglia the director of research. The idea is now manifested in the printing of the first twelve titles of (36 and counting) of The Guyana Classics Library which include ‘The Discovery of Guiana’ by Sir Walter Ralegh first published in 1595, ‘The Coolie, his right and wrongs’ by John Edward Jenkins, ‘Canoe and Camp Life in British Guiana by Charles Barrington Brown, ‘The Chinese in British Guiana’ by Sir Cecil Clementi, ‘The Asylum Journal’ by Robert Grieve and ‘Guianese Poetry: covering the hundred years’ period, 1831-1931’ by N. E. Cameron. Each title comes with its own scholarly introduction and a series preface. The series preface is written by the President of Guyana, H. E. Bharrat Jagdeo and is instructive and informative, obviously giving an insight into the publication of The Guyana Classics Library. This preface fittingly discusses the first book on Guyana, going on to give an outline of Guyanese Literature to present day. ‘Moving from Exploitation to Expression’ is captured in this series of carefully selected books, a series of publications that would foster pride of place and would inspire further development in Guyanese Literature and further development of the state of Guyana. 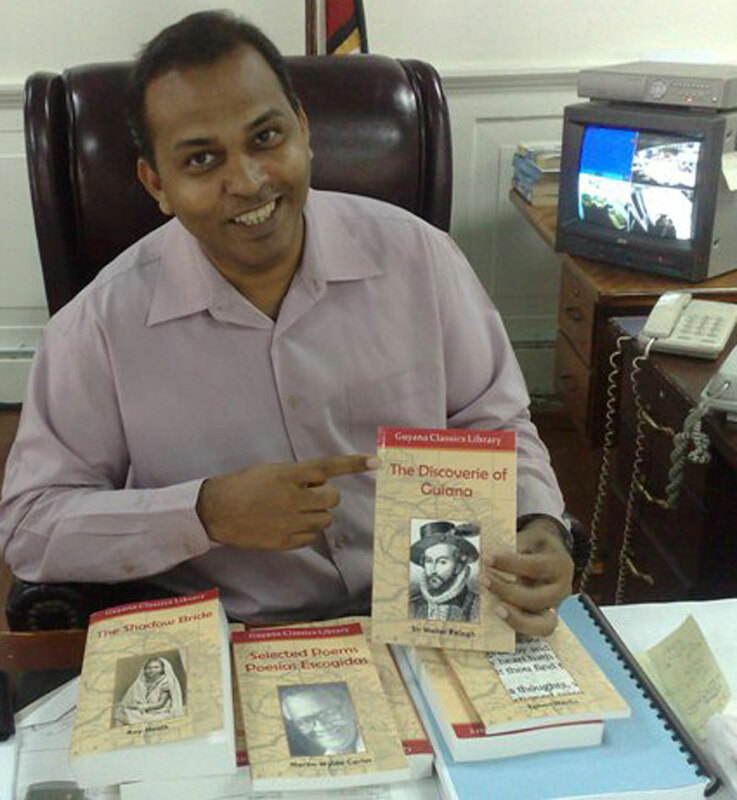 Minister of Culture Youth and Sport, Dr Frank Anthony showcasing a copy of one of the Guyana Classics. Minister of Culture, Youth and Sport, Dr. Frank Anthony, yesterday, gave the Government Information Agency (GINA) a sneak peak at the first 12 of 36 books titled “Guyana Classics” to be launched in February. The 12 copies which are prefaced by President Bharrat Jagdeo, include the first book to be written about Guyana, Martin Carter’s poems and a book on indentureship among others. Some of the books trace Guyana’s history as far back as the 1500s. Minister Anthony said that the books are scheduled to be launched by mid February as part of the calendar of activities to mark Guyana’s 40th Republic and Mashramani celebrations. The materials were manufactured by the Caribbean Printing Press which falls under the ambit of the Ministry of Culture Youth and Sport. Copies will be available at national libraries and research centres across the country. The “Guyana Classics” initiative emerged at a meeting between President Bharrat Jagdeo and Professor David Dabydeen during Guyana’s hosting of the Caribbean Festival of Arts (CARIFESTA) X in 2008. The need for a Caribbean press was highlighted and it was agreed that the Guyana Government would establish a press to publish written materials about Guyana and the Caribbean.